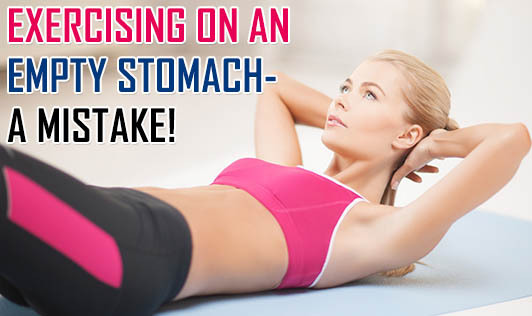 Exercising on an empty stomach - a mistake! You must have heard a lot of people say it is good to exercise on an empty stomach as eating before exercising might cause stomach or muscle cramps and vomiting too. But there are some scientific reasons as to why one should not exercise on an empty stomach. For exercise (any kind of physical activity), your body needs energy, just as your car needs fuel! If you exercise on an empty stomach, your body will be exhausted of fuel before you complete the exercise target. This leads to lesser stamina, and poor performance. The pre-exercise meal or snack should consist of carbohydrates mainly, as they are the immediate source of energy. If you are exercising early in the morning, have a cup of milk or a fruit or a couple of rusks/crackers or a small bowl of a breakfast cereal with milk or a small sandwich, 30 to 40 minutes prior to exercise. If you are exercising after a major meal (breakfast or lunch), make sure you give a gap of two to two and a half hours before you begin. It is very much necessary to give a gap between your meal and your exercise session. If there isn't sufficient gap, you will end up getting a stomach ache or you may feel like vomiting. Now whenever you exercise, make sure your body is neither deprived of energy, nor is it overloaded with food!